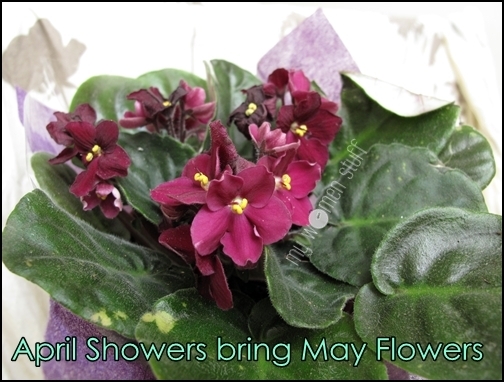 Home » Beauty Roundup » April Showers Brings May Flowers – Care tips for African Violets? 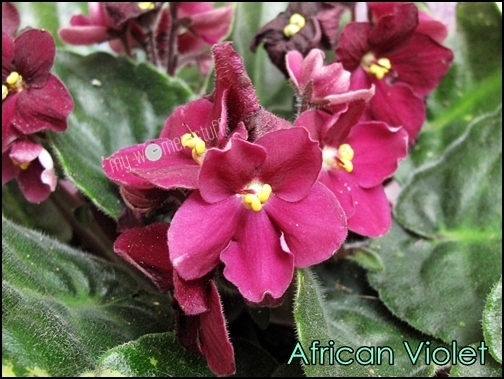 April Showers Brings May Flowers – Care tips for African Violets? I think someone forgot to turn on the shower for April here. Its been sweltering and I’m still feeling a little out of sorts. So stay indoors, drink lots of water and browse what some of my sisters in beauty have to say for the month of April. But since April Showers bring May flowers, let me show you a pretty pot of African Violets I received recently. The tag on the pot said they are African Violets (Saintpaulia) although the flowers look more purple than violet which I tend to associate with more blue tones. They are house plants and meant to be kept indoors and watered sparingly. I’ll try my best to look after this pot. I don’t have a good track record with plants. People have a green thumb, I have a brown thumb – plants tend to die in my care. Do you have a green thumb or do you have any tips for looking after the African Violets? I’d be happy to pick up some tips! NEXT POST: Grab a Satchel and lets get back to school! It’s excellent that the gift was a potted plant rather than a bunch of flowers wrapped in cellophane! I always feel sad for “dead” flowers because as gorgeous as they are, they live for only days and then wilt away. They should be kept alive and enjoyed. If these are really sturdy plants, I want one for my office room! Yes! I am not for bouquets too because the flowers die so quickly and I find it wasteful. oh i love african violets!! i have a few pots at home and you can propagate them v easily!! do water on the soil only!! dun let any water touch the leaves or they will rot~..
hehe sorry for the long post! Lovely flowers! Sorry to be cheeky, but I am wondering if it was an equally lovely guy who sent those to you?? 😀 hehe! I do agree with evie that you need to water on the soil only. You’d better get a device to do it. My mom used to have many African Violets and you must make sure there isn’t any cats and dogs around or once the leaves rot you’ll know what happened hahahha 😛 If not mistaken they are easily taken care of and you don’t need direct sunlight.